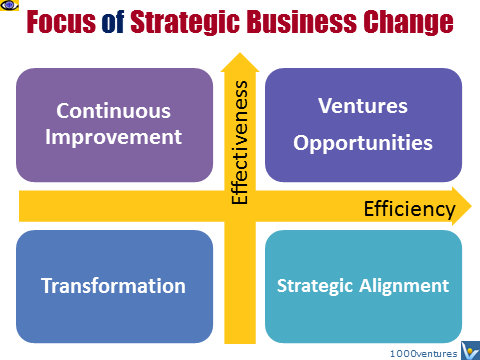 To decide which business change and strategic innovation concept is appropriate to your company, the first thing to do is to ask whether the company is generally doing the right things (effectiveness), but just needs to do them better (efficiency), or whether it needs to do new things. Ask also whether your company is faced with an evolutionary or radical change in its industrial sector, and how you are going to manage this change. Creative destruction and restructuring measures should come first and followed by regeneration of the organization and strategy as steps of long-term fundamental transformation if a company is neither effective nor efficient. If your company achieved high operational efficiency but lacks effectiveness, work on your business and answer critical questions about its strategic alignment and streamlining of corporate internal resources and capabilities. If your company is effective, but not efficient, the management focus should be on implementation of continuous efficiency improvement measures and, ultimately, establishment of an enterprise-wide business process management (EBPM) system and a lean enterprise. If your company is both effective and efficient, healthy and successful, you may wish to develop new top-line growth and venture strategies, or use opportunity-driven business development approach aimed at increasing the effectiveness of a company through the pursuit of new business. Understand that CHANGE IN NEVER OVER. See your organization as a winning team of rafters that strives to win a race in white waters of a rough river. Know how to Manage Change!